The Levy's M7GP is a 2" garment leather guitar strap with easy-slide polypropylene backing and tri-glide adjustment. 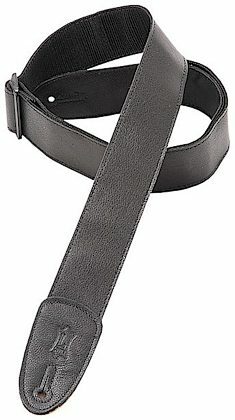 This strap is adjustable to 56". Every Levy's strap is designed to be comfortable, durable, and fashionable, because it's not just something to hold up your instrument, it's something that reflects you and your style. By continually developing great designs and improving existing ones, Levy's offers the highest quality and broadest variety of guitar straps on the market. From simple to elaborate, from classy to crazy, from lightweight to heavy-duty, there's a Levy's strap for every player. zZounds is an authorized dealer of Levy's products. Levy Warranty ﻿Levy straps carry a lifetime warranty against any material or manufacturer defects.